We’re in the ancient city of Meknes, west of Fez, and we’re standing in front of a huge gate of marble, stone and colorful tiles, and wondering, Now what? The gate, Bab el-Mansour, is enormous, one of the biggest in Morocco, a country with an abundance of massive doors set into thick walls. It’s fabulous, a chunk of history and craftsmanship. But we’re surrounded by honking traffic, gawking tourists, donkey carts and shoppers, plus a horse-and-carriage lineup. We know Meknes has a lot more than this, it’s a World Heritage Site. We need a guide. There’s never a shortage of guides. Several magically appear, eager to help. We go with Mohammed, a pleasant-faced man who offers a 1-hour tour of the Berber medina for a few dirham, about $5. We traipse after him, across El Hdim square into the winding, narrow streets of the old section, where artists work in little shops. 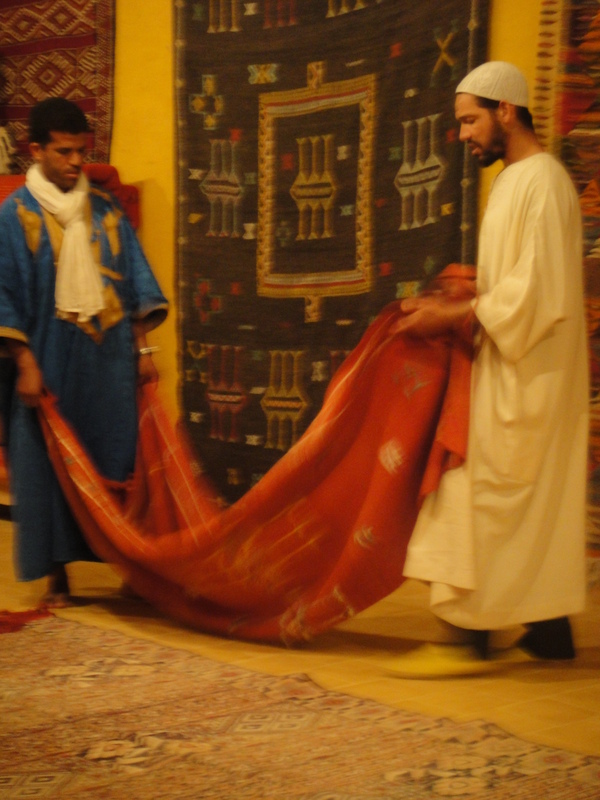 Silk weavers, tile workers, cedar carvers, saddle makers, furniture painters. 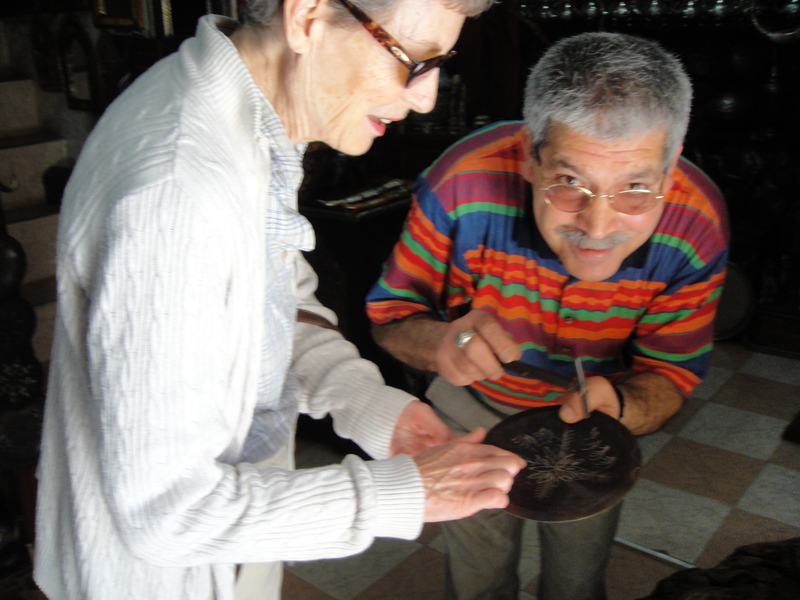 These are some of the finest craftsman in Morocco, we’ve heard. Mohammed has another mission: get these tourists shopping. A man who demonstrates a process of engraving silver on metal, called damascene, sells us a little plate, and as we leave Mohammed ducks back to the shop for, he says, “the toilet”–of course it’s his commission. That’s fine with us, it’s helping him and the economy. 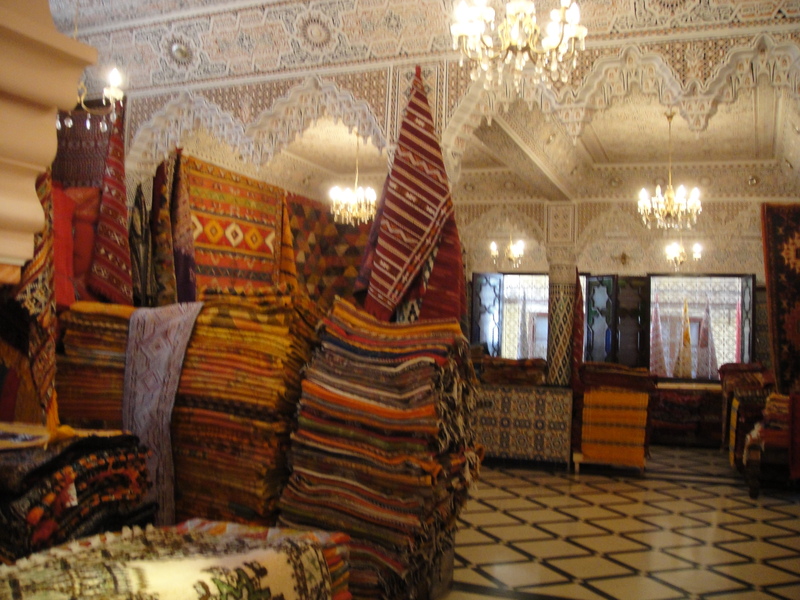 He hustles us off to fabulous Kilim carpets, embroidered linens, hand-woven scarves. No more sales, but we have a good time admiring the work, and he gets a handsome tip. We end up back on the square sipping mint tea in a cafe and watching the acrobats and musicians. 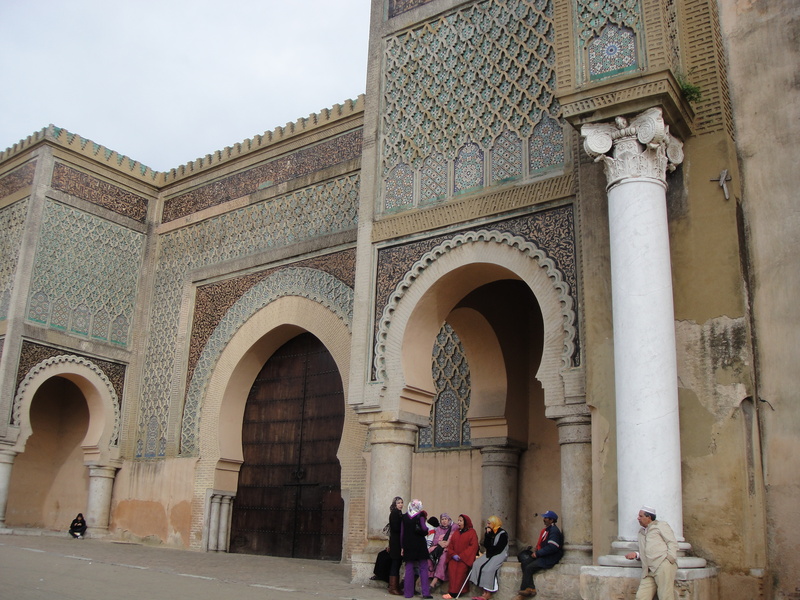 Meknes was founded in the 11th century. It had water, fertile soil and olive trees, and did well. Then came Moulay Ismail, a sultan with 500 wives and grandiose dreams. Some 250 years ago he built (or rather, his slaves built) miles of walls, huge granaries and stables, stone palaces and gardens. Also some very big arched gates, including Bab el-Mansour. Under the sultan, Meknes became the largest fortified city in North Africa. This man had more power than your average king. Visitors can see the mausoleum where he’s buried, but non-Muslims can only peek at the tomb room. Moroccan craftsmanship is outstanding. Pottery, gorgeous embroidery, wood carvings, jewelry, stunning carpets and more are on display in the Dar Jamai museum, itself a work of art. Once a 19th-century mansion, it’s elaborately painted and carved, every room a jewel box. And there’s a pretty courtyard garden. As if architecture and design weren’t enough, Meknes is also known for its wine. The French planted grapes in the early 20th century, and now some good wines are produced here. This is not a common thing in a Muslim country, and we’re happy to find it and taste it wherever wine is allowed. Bogey dealt with nefarious characters and a lost love, but he didn’t have to face hordes of motorbikes and honking traffic playing dodg’em with pedestrians. To cross the street in Casablanca these days, you join a cluster of savvy locals and walk fast. New to Morocco, we latch quickly onto Younes, a friendly guide/taxi driver, and he helps a lot. An urban guy with a sense of humor, Younes shows us the sights. Rick’s Cafe is here–a very nice restaurant–but no other hint of Casablanca, Ingrid Bergman or Humphrey Bogart. Why would there be? The movie was filmed entirely in Hollywood. This is a bustling port city of 3.5 million people and it seems like just as many cranes at construction sites, working on new resorts and commercial developments. 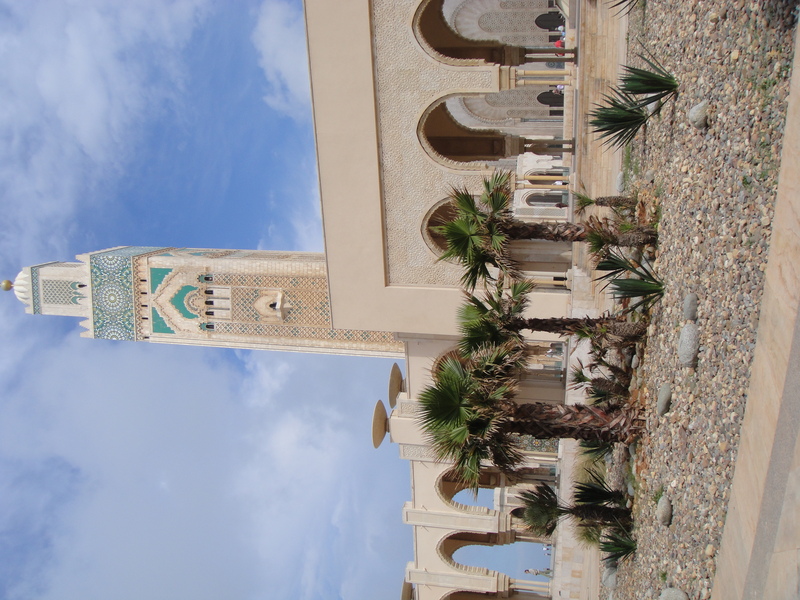 Still, there’s enough exotic intrigue in the name to have allure, and there’s one big–make that immense–famous draw: the Hassan II Mosque. No question, it’s hiuge, beautiful, and awe-inspiring. It ought to be, for $800-$850 million (reports vary). The complex, on the edge of the Atlantic, has a square that can hold 80,000 people, and the minaret on the mosque itself is the highest in the world–210 meters. 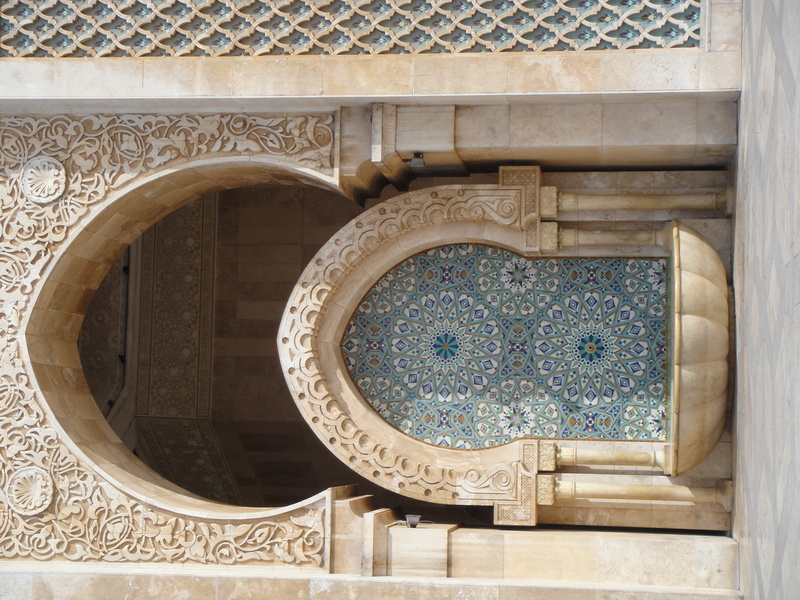 The intricate tilework, perfectly carved arches, and fountains are stunning. It took hundreds of workers and artists years to complete. It’s one of the few mosques open to non-Muslims, who can see it on guided tours. We marvel over the place even as we shake our heads over royal opulence close by the miserable housing of the poor. But that’s only one viewpoint. 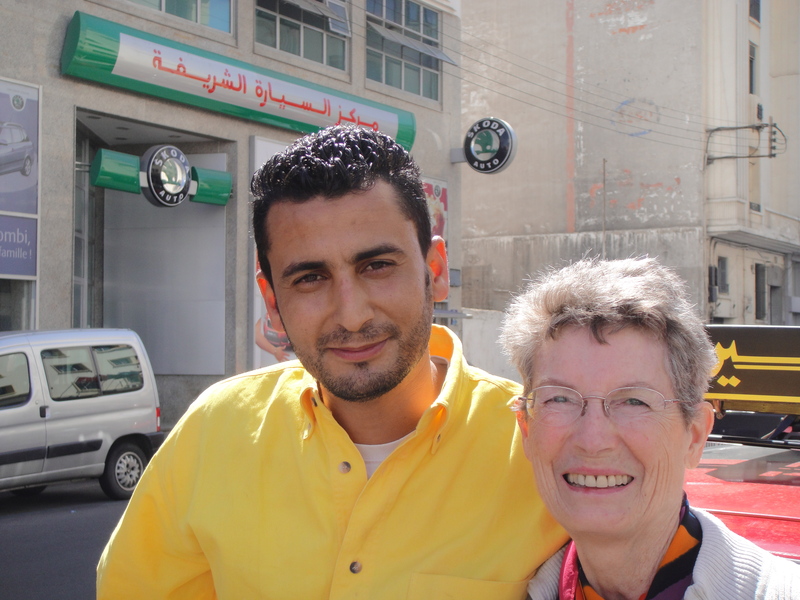 The people here are very proud of their fabulous mosque, according to Younes. 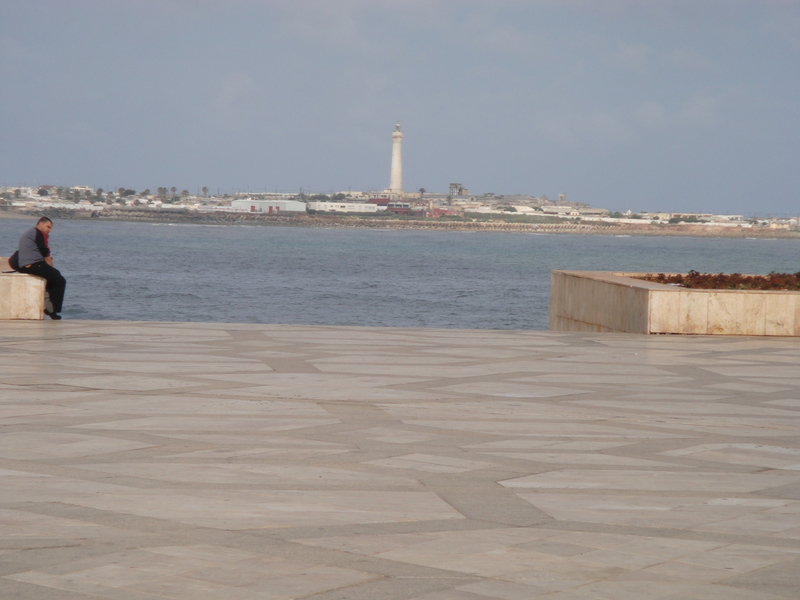 Across the bay is another Casablanca landmark, the lighthouse. And there’s La Corniche, the beach and boulevard that curves beside it. Lots of cafes and trendy hangouts here, along with KFC and McDonald’s. Casablanca has the appeal of vibrant life and action. It has that astounding mosque. And the pianist at Rick’s Cafe does play “As Time Goes By”–but we’re heading for other, still-old parts of Morocco. My own personal camel seems aloof, yet tolerant of one more awkward tourist struggling to climb aboard. I name her Fluffy, for the fur on her neck. The white-turbaned Berber guide helps me–upsy-daisy, forward and back, rocking-horse style, as Fluffy rises from her knees and I cling to the t-bar on the saddle. When everyone in our little group is lined up, our guide leads us into the Sahara. Wow, here we are in the desert, just like the caravans of old, crossing the shifting sands of eastern Morocco. Well, not exactly. Those bands of Berbers, the indigenous people of North Africa, traveled for weeks to trade on the far side of the immense Sahara. It was their life, and this is only a tourist experience. Still, we’re following their trail, rich ground for the imagination. 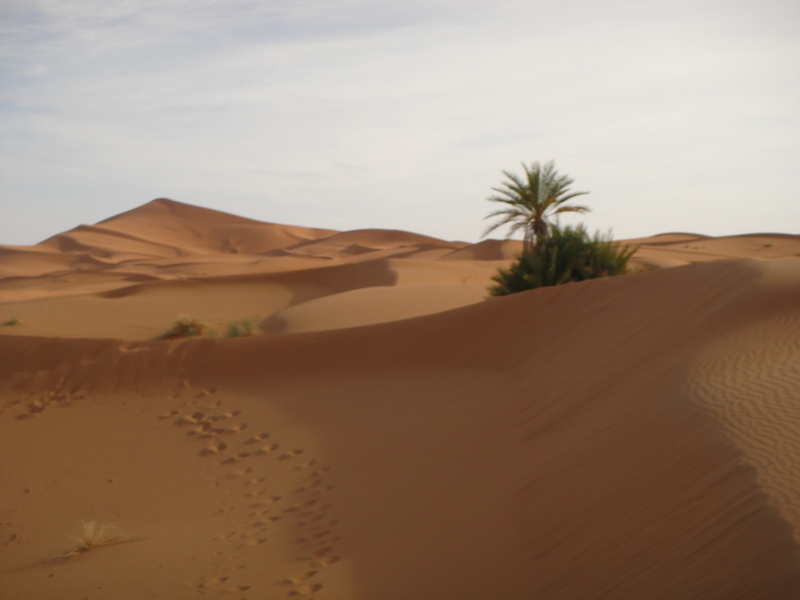 The Sahara’s miles of sand rise in wind-carved ridges and drop to ravines. There are a few sparse shrubs and beetle tracks. The snakes, lizards, and desert foxes are probably asleep in shady spots as we plod through their territory. With the changing afternoon light, the stark landscape shifts from pale brown to gold to pink, an austere beauty that tells me I am indeed far from my green, watery home. This place is so hot and arid I can almost watch my skin shrivel. The saddle is actually a big padded cushion, easy on the sit-bones. But camels are high and really wide, and we aren’t used to doing the splits any time, let alone for 2 solid hours. We’re mighty glad to reach camp at the foot of a ridge, ease down from the nonchalant camels, and wobble away. We eat dinner sitting cross-legged at a low table on the sand. It’s delicious. Fresh tomatoes, corn, onions, and a stew of peas and beef, cooked by the savvy Moroccan guides in a little tent kitchen. A full moon rises, huge and glowing orange. We drag pads and blankets to a flat spot and lie back to wait for the dazzling stars. Alas, not tonight. Clouds gather, the wind picks up, rain drips. Rain, in the Sahara. If travel teaches you anything, it’s to expect the unexpected. Sand blows into our ears and we scuttle into a tent for a more-or-less comfortable sleep. I’m wakened at 5 by a snuffling, snorting sound. 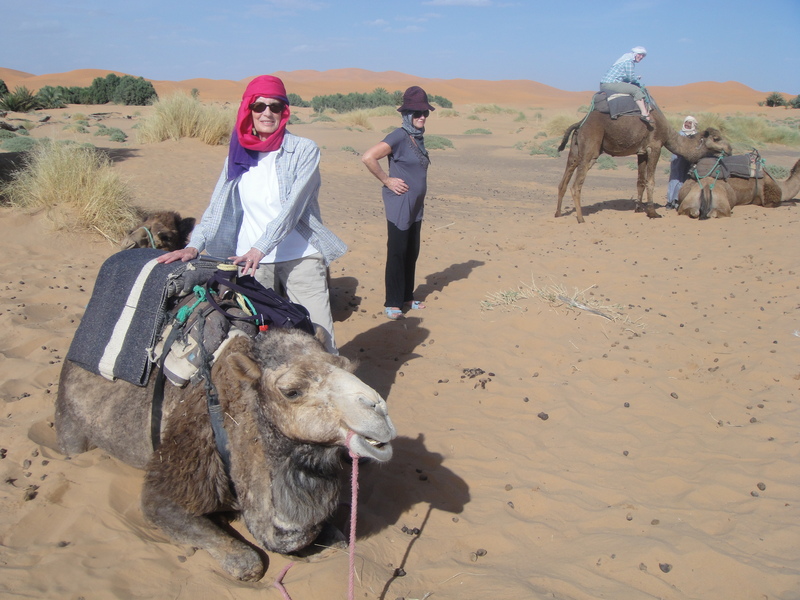 No, it’s not my husband, those are camels, ready for the morning ride. We stumble from the tent, our gear stuffed into bags, and I again rock up onto Fluffy’s back. We’re buddies by now, and she’s headed home. Two hours later we’re back in Merzouga, a village of scattered clay homes, inns and shops. 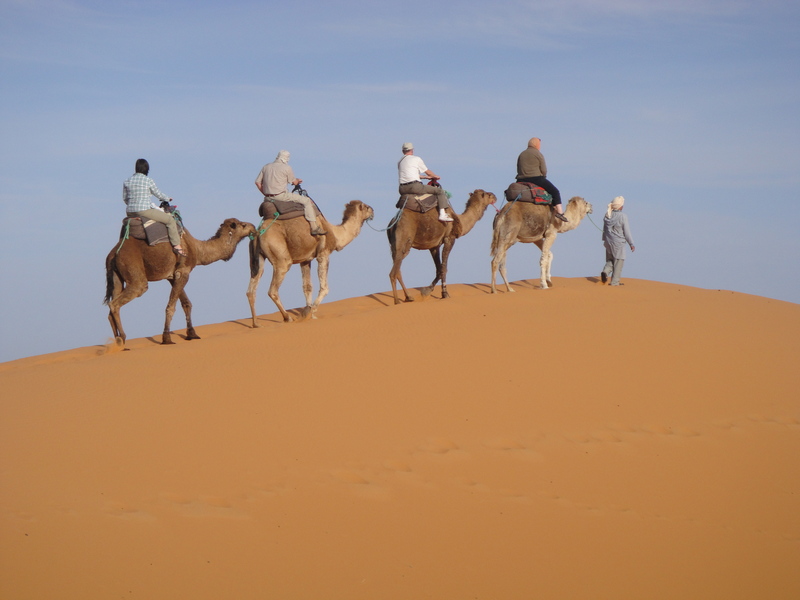 Our lodging at the edge of the Erg Chebbi dunes is Auberge Sahara, a clay-and-straw inn with simple, comfortable rooms and, happily, a swimming pool. We eat breakfast, revel in hot showers, and say goodbye to our guides and camels. Thanks, Fluffy, and so long, I’m on the road again, headed for Tenerhir and the Todra Gorge.